Although several physical attributes must be observed, such as the shape of the head, color of the belly and type of scales, in order to positively identify a species, a snake's color and pattern give immediate clues that can be noted from a safe distance. True diamond patterns on a snake are rare, and snakes with these markings should be considered dangerous until positively identified. 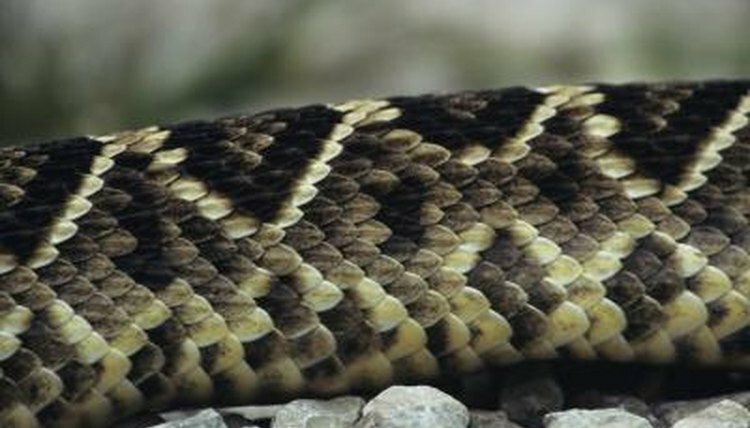 Diamond-shaped markings are common to only two types of snakes in North America. There are, however, other snakes with similar markings that are sometimes mistaken as having diamond-shaped markings. These actually have markings that are referred to as blotches or reticulation rather than diamonds. The difference is that diamond markings are well-formed and defined, with four distinctive corners. Diamond-patterned snakes may appear as if they have an "x"-shaped criss-cross pattern down their back where the outlines of the diamonds intersect. The pattern on blotched or reticulated snakes that looks similar to diamonds is actually patches of color that have a rough diamond shape, but with rounded corners and slightly distorted edges. If the pattern is not sharply defined, it is not a diamond marking. The western diamondback is one of the most well-known species of rattlesnake. It is named for the pattern on its back, which consists of a series of diamonds with an outer frame of white, an inner frame of dark brown and a mottled pattern in the center. The rest of the snake's body is tan or light brown with a small amount of mottling. Western diamondbacks are found in the western U.S. and are the largest rattlesnake in the region, reaching lengths of up to 66 inches. They are also responsible for the most rattlesnake bites and deaths in the U.S. and are highly venomous. The eastern diamondback rattlesnake is not quite as infamous as its western cousin, but is also highly venomous. It is found in the southeastern corner of the U.S., mainly in Florida, Georgia and neighboring coastal states. The eastern diamondback has a very similar pattern, but is often darker-colored, with a tan outer frame around the diamond, a black inner frame, and a body that is mottled in a green/brown pattern. It grows even longer than the western diamondback, reaching lengths of up to 8 feet. The diamondback water snake's name is a misnomer since the pattern on this snake's back is actually reticulated. The lighter tan portions of a diamondback water snake's body are somewhat diamond-shaped, but the corners are rounded, giving the darker color surrounding the diamond shapes a banded or warped ring-like appearance. Unlike the western and eastern diamondback rattlesnakes, the diamondback water snake is not venomous. It is found mainly in the south central U.S. states, but specimens have been found as far west as Texas, as far south as Mexico, and as far north as Indiana. Other common snakes that look like they have diamond patterns, but actually have reticulated or blotched patterns include the rat, pine and gopher snake; and the mohave, black-tailed, ridge-nosed and tiger rattlesnakes. Many of these snakes have dark-colored blotches that are roughly diamond-shaped with rounded corners and light tan skin on the rest of their body.